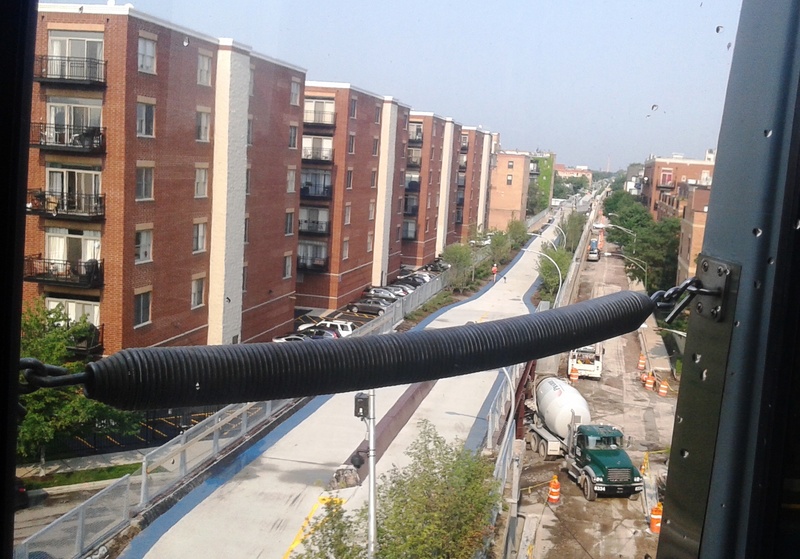 A view of the 606 trail from the inbound CTA Blue Line. For decades, I traveled on the Chicago Transit Authority Blue Line elevated train between home in various neighborhoods on the North Side to and from downtown. On every trip, I passed over a long-abandoned railroad spur known to most as the Bloomingdale Line. It was aptly named because much of the line ran parallel to Bloomingdale Avenue. But during all those years, I never ventured onto the Bloomingdale, even though many types of people used the line, reportedly for both pleasure (jogging) and surreptitious activities (gang initiations). 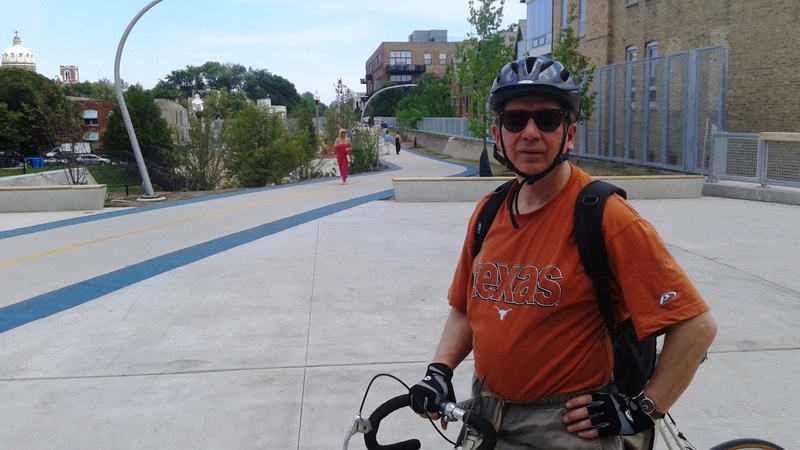 Following years of work from dedicated people and sparked by a $95 million makeover, the Bloomingdale was re-christened June 6 as the The 606, Chicago’s newest linear park/trail. The 606, which goes from Ashland Avenue on the east to Ridgeway Avenue on the west, spans 2.7 miles of a reclaimed Chicago transportation route. Taking a rest break at Damen Avenue. So I had to visit. On a bright and glorious Sunday afternoon, Susan and I rode our bikes from home in Avondale a few miles south to the entrance at Humboldt Drive. The 606 was crowded that day, but not in an uncomfortable way. We had to veer around pedestrians on occasion, and only a few times did we encounter a fellow cyclist who simply had to pass fellow trail users in a sprint. Already, there are concerns over gentrification and concerns over crime on Chicago’s popular new route to get from here to there and not encounter a motorized vehicle. But that’s expected with a resource that’s new, cool and popular. On my morning and evening Blue Line commute, I always observe people using the 606. 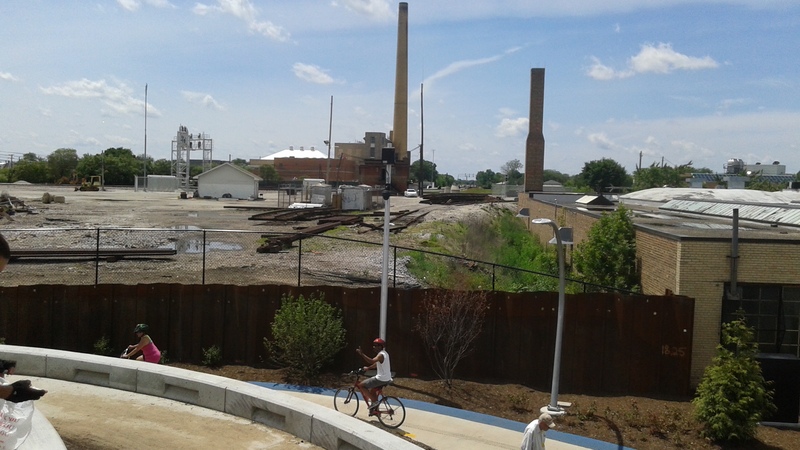 The western end of the 606 trail provides a view of what’s left of Chicago’s industrial might. Once the Bloomingdale Line functioned partly as a freight spur that brought raw materials to the many small manufacturing industries that lined both sides of this unique urban trail. Most businesses, if not all, are gone, replaced in some areas by townhomes. But I hope that funds are raised soon to erect historical signs that chronicle the industrial history of the surrounding streets before the foundries, warehouses and assembly plants shut down in the 1970s and 1980s. A lot of effort and money went into giving this urban guideway a new purpose; but we shouldn’t forget what this uniquely Chicago transportation resource was originally designed to do.